Hakushu means applause or ovation…literally clapping hands…and Hakushu Distiller’s Reserve will make you stand up and cheer. In the 90 years since then, Suntory has expanded through home grown brands and the acquisition of established business around the world. Perhaps most notable of which was their acquisition to American distiller Beam, Inc. in 2014, brining their worldwide sales to more than $10 billion per year. Not too bad. Their various holdings produce dozens of Whiskies, beers, liqueurs, and soft drinks that span the globe. In Japanese, Hakushu means applause or ovation… literally clapping hands. Seems fitting for a honored distillery crafting fine, single malt goodness about as far from Scotland as you can get without seeing penguins. 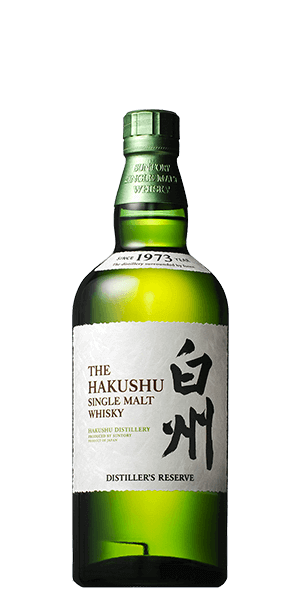 And They refer to Hakushu as “the verdant Japanese Whisky” because they all come from a distillery deep in a volcanic, temperate rain forest surrounded by green trees and foliage. Lovely. Hakushu Distiller's Reserve Japanese Whisky is an NAS, but don’t let that throw you. This is really good stuff and a genuine master blend of their single-malt from various vintages. And the Chichioya (fathers) over at Suntory are FAR too protective of their collective reputations to let a sub-par also-ran slip past their watchful eye. To our taste buds, Hakushu Distiller's Reserve Japanese Whisky drinks like an average age of about 10 years of their award winning dram. Senpai! What does The Hakushu Single Malt Whisky Distiller's Reserve taste like? The Flavor Spiral™ shows the most common flavors that you'll taste in The Hakushu Single Malt Whisky Distiller's Reserve and gives you a chance to have a taste of it before actually tasting it. Mint and pine, with wet grass and citrus and just a pinch of smoke. Long, and a hint of toasted wood. Smokey and a slight hint of spicy. This was my first encounter with Japanese whiskey and my second encounter with whiskeys over all. Im a beer drinker that fell in love with a single malt. Amazing whisky with fresh new flavors than bring a brand new dimension to whisky. Recommend avidly for someone looking for new experience with whisky! Very strong citrus flavor, low in peat taste. Tastes like scotch and a sweet whiskey were blended together. Not bad for what it is, but not great if you want a scotch. Got a lot of citrus. Not bad but not really my taste. Nice common flavored single malt. Average. Light. A little smokey. Like it nice after taste. The Japanese have got it going on! I will definitely be on the lookout for this bottle. This is a bold whiskey with spice and bit more bite. I would liken it to the spiciness of Talisker, but with an American whiskey mix. Smooth. Lively finish. Smokey nose with a nice vanilla top note. Smooth and slightly smoked with a spicy finish. Nice smokey taste with an aftertaste of apple left on the pallet. Definite fruit to the nose. Quite smooth - very tasty. Sensational Japanese Whisky. Gives some Islay whisky a run for their money.